Laura Paeglis is on target for the Buenos Aires 2018 Youth Olympic Games in October. The competition starts on the 12th of October and runs through to the 17th, with qualification rounds on the 12th, team matches on the 13th and 14th, and then individual matches occurring from the 15th to the 17th. 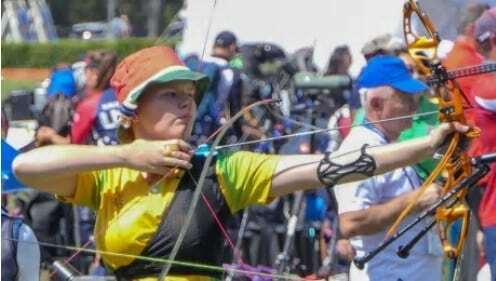 Laura will be Australia’s sole female archer at the event after qualifying Australia for a position at last years World Youth Championships, and then beating out Australia’s best Cadet Recurve archers in a 2 day shoot-off event to earn the coveted nomination. Beginning archery after watching the movie ‘Brave’, Laura has worked hard to develop her skills at her home club A.I.M. Archery Club, and at Sherbrooke Archers, regularly attending local and State competitions and representing her State at the National level. Recently she has worked extensively with the Australian National Coach and the High Performance arm of Archery Australia as well as gaining a scholarship at the Victorian Institute of Sport. Archery Victoria wish all the success possible to Laura in her quest to compete at the top level Internationally.